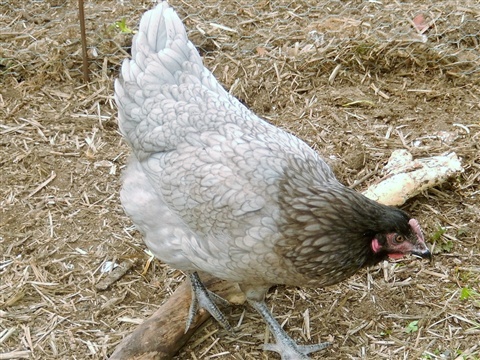 24th March - Serious Chicken envy here!! My daughter's family has now been extended. 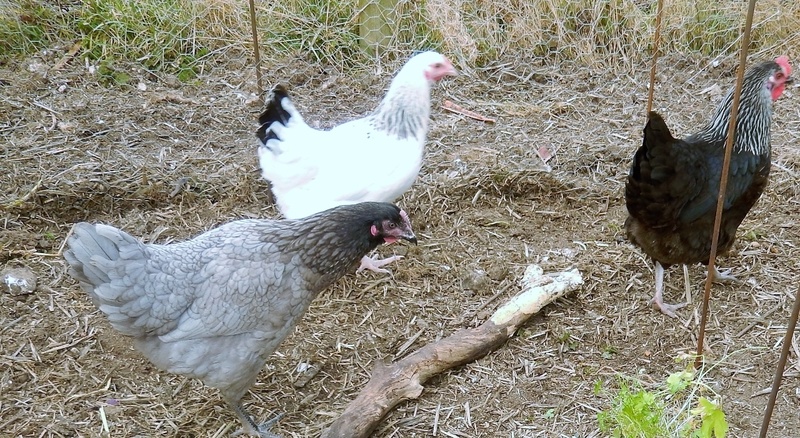 Four point-of-lay pullets not quite old enough to cluck and still finding their way in life arrived last Sunday. I could not resist sharing their photocall with you, as they are such gorgeous girls. I would love to have chickens, but in our garden that is not easily possible, and at the plot they would not be so much like part of the family, so now I can enjoy my dream vicariously through these little lovelies. I feel sure they will be figuring again in the blog from time to time, and I know that their four owners - aka my four eldsest grandchildren -- will look after them well and do their best to get them to answer to their names. 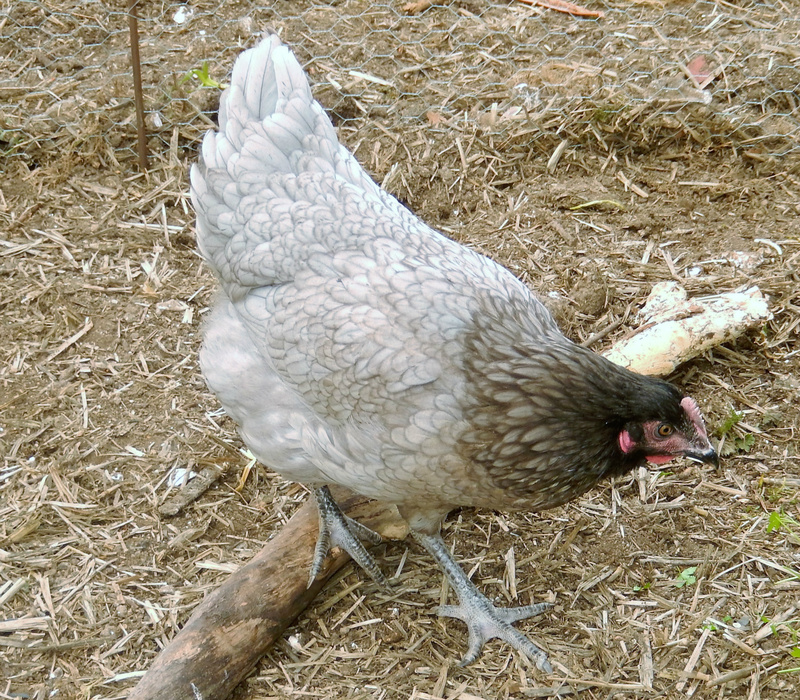 We have not spent all our time playing with the chooks of course. Three more days of hard slog and things are looking good down on the plots! # 145 now has two rather smart functional gates. They should help keep out passing rabbits for sure, and as there is direct access between the two plots we are not very welcoming to these bunnies, even if is is Eastertide. They nibble anything remotely juicy! The remaining onion sets are in too. On #146 some of the sets had been dislodged, probably by blackbirds pulling at the dry shoot ends, and it is heartening to see how much root growth there is under the soil already, and despite the lack of recent rain, the soil is plenty damp enough for them to be growing away nicely. I know I usually post on Mondays, but this is a bit early as we are taking a break over Easter. I have around sixty chilli seedlings, plus five aubergines, to pot on before the weekend, tomato plants to pot on (again!) and seeds of our tall maincrop peas, and our beetroot, to sow in modules before we go. The newly germinated tomato and sweet pepper seedlings need to have space found for them in the greenhouse as leaving them in the propagator for a further week is not a good idea. And then there is the long list for our friend Lesley, who has bravely volunteered (or was she press -ganged?) to water everything in the greeenhouse while we are away. Thank you, Lesley! 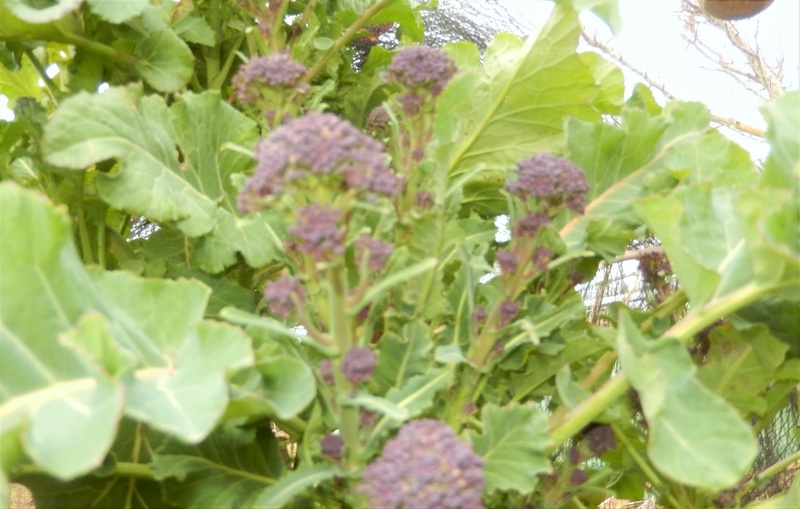 The Purple Sprouting Broccoli has been worth waiting for! 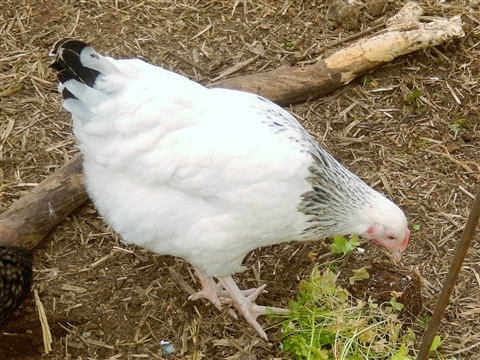 21st March: Parsley, Sage, Rosemary and Thyme ... plus all the others, too! 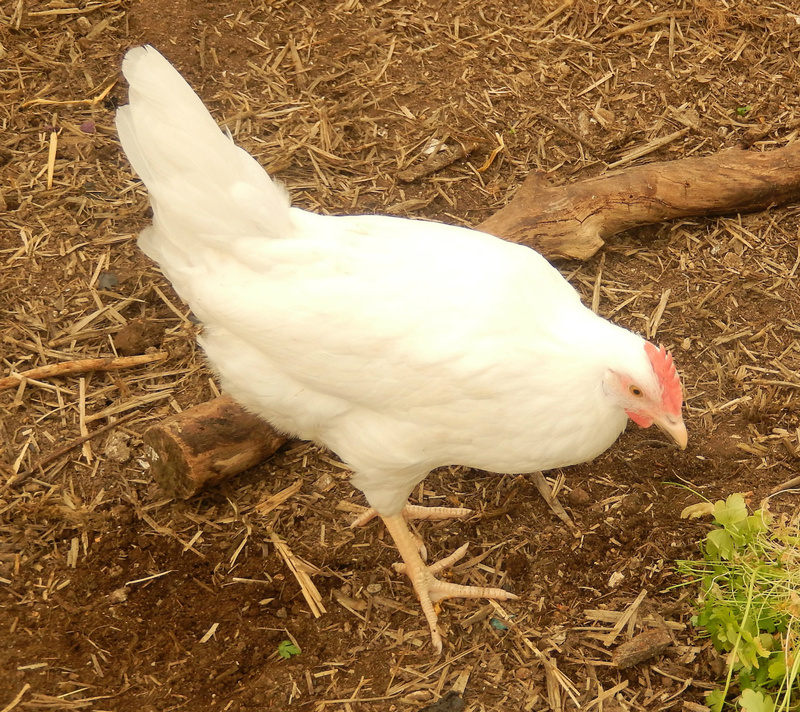 This week I have been adding up how much the crops we have consumed so far this year would have cost if we had bought them in the local supermarket, and I suddenly realised the monetary value of the herbs we take for granted. This weekend's roast dinner for example included a huge handful of Sage, a small bunch of Thyme and some Rosemary, plus some snipped Chives. Even at the modest price of 90p per bunch ... well, you can work it out. And that's just one meal. However, if those herbs were going to cost that amount I couldn't afford to buy them, so is this money really saved if I would not have spent it in the first place? Food for thought!! We do have herbs galore though, with Hyssop, Spearmint, and Fennel also ready to use, with more being added as the season goes on. On the subject of herbs, we planted a short Rosemary hedge and a parallel row of Oregano plants this week, to line the path between our two plots,and now that the path is covered with woodchip it looks very inviting. The bees will love this Oregano in the Summertime! Work has been proceeding well on #145, and we now have three of the eight planned beds dug, with one even planted up with potatoes. These beds are 5m long, whilst those on #146 are only 3.6m in length, so I had to recalculate how many seed potatoes would fit in: 11 rows of 4 is about right, which is 8 rows of Bonnie (second earlies) and 3 rows of Ambo, which are a maincrop variety. Ambos can grow really large: last year our eldest two grandchildren helped dig these up, and were excited to see potatoes "The size of my head!" as Pearl put it!! The first earlies are in too, on #146. We have gone for Casablanca this year, which we have never grown before. 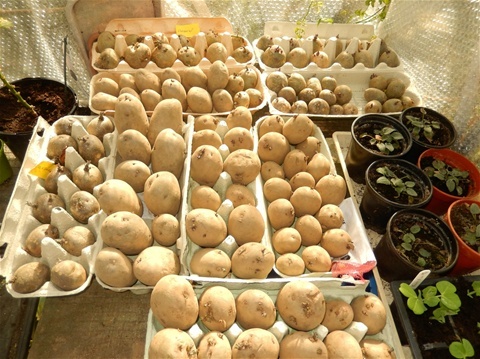 The picture in the catalogue showed beautiful white potatoes, so let's hope they turn out something like that! Six short rows, with 2 short rows of Maris Peer, which are technically second earlies but on the recommendation of a friend, which said they were the sweetest new potato she has ever tasted, in they went!! The beauty of the short rows is that they can be dug up in small quantities once they are ready to harvest. Works well for us. Both beds have had Blood, Fish & Bone and chicken manure pellets added, but the one on #145 also had a decent handful of growbag compost added per tuber too. The difference in the soil between the two plots is amazing: rich, dark and crumbly on #146 after six years of regular additions of organic matter, and yellowy brown lumpy clay with huge stones in on on #145. Makes you realise that all that "soil improvement" work does pay off in the end! Half the onion sets are busy growing roots now, with one tiny green shoot popping up this afternoon. The half a dozen of each that were started off in modules earlier in the year are planted out too. Will these make larger onions than those planted as dormant sets? We shall know around August time. I was sent a double lot of Hercules sets by DB Brown, as some from the first order were soft, so there are enough to plant on #145 now too. Their bed awaits! 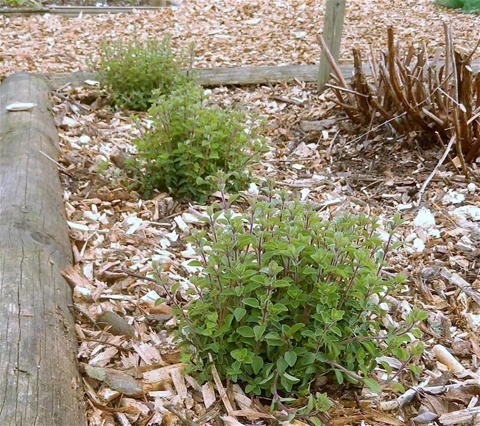 Free soil improver -- leaf mould! 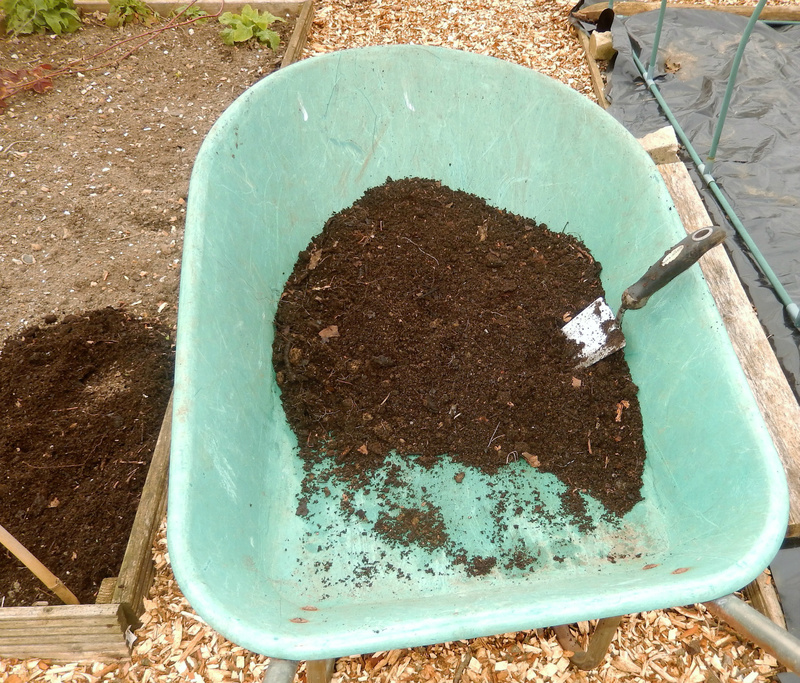 Please, please do collect and stack autumn leaves to make leaf mould .. in a year's time you will have the kind of beautifully fine dark stuff shown here in the wheelbarrow. We are about to embark on making an even bigger leaf mould stack for next Spring now we have more space. And it is all free!!! We are lucky that our local council workers bring enormous quantities of leaves onto our site, and will even carry them round to our plot in their tractor bucket too, which saves us many trips pushing a wheelbarrow. If you ever read this guys, we are really appreciative -- thank you! The last of our fruit trees were planted today. A dwarf Conference Pear, full of flower buds, completed our little orchard and a standard fig, which I think is Brown Turkey, is in a sheltered sunny spot down near the sheds. 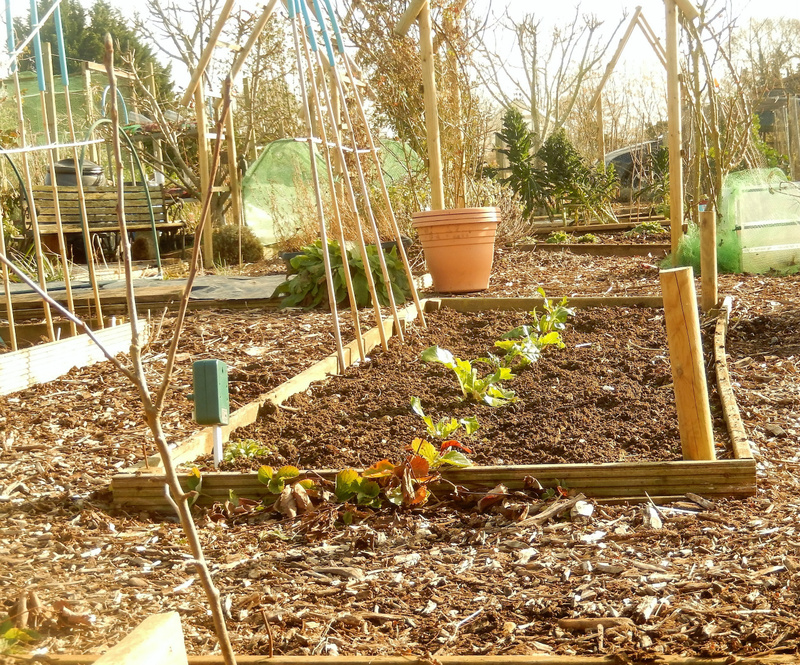 Plot 145 on 21st March 2016 -- potatoes in the far bed already. The other beds are now all marked out and we are trying not to walk across them, and stick to the paths. This was laid a day or two ago -- the blobs have expanded and flattened out a bit now, although the eggs are still round. 14th March - Frog Spawn!!!!!!! Every year the frogs in our pond spawn much later than in other nearby ponds, mainly I suspect because our pond is situated behind the north facing garage and so is bit colder than those in sunshine. 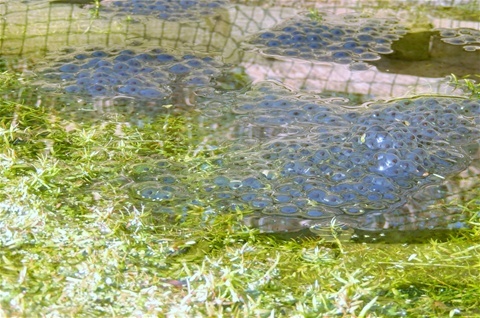 My daughter's neighbour down in Hampshire had spawn in her pond three weeks ago and now has tadpoles galore! 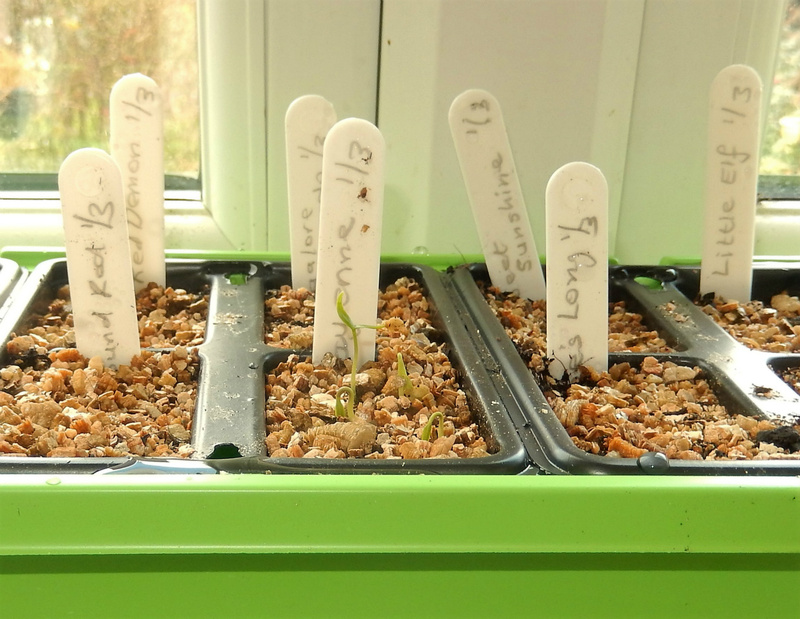 While we were away last week, the chiilli seeds germinated and turned into a veritable little forest on the windowsill. The fresh Lemon Drop seed came up much more quickly than the ones left from last year that I sowed, and the Alberto's Locato Rococos, that I struggled to get even that one plant of, have popped up like mustard and cress! The Black Beauty Aubergines have appeared but not one of the Turkish Orange yet. I say "yet" as I suppose there is still a chance, albeit a very small one. Ever the optimist! As I walked into the greenhouse I could positvely smell those plants all growing. Both the Kent Blue and Indian Golden Podded Mangetout are ready to be hardened off now. They are waving their little tendrils around ready to climb. That reminded me that I have not grown any peashoots yet this year, so I bought a very large bag of dried peas in the supermarket so that I can start some off. This is definitely the cheapest way to grow these really expensive treats. I'll keeep you posted as to how long it takes from dried pea to juicy shoots to eat... won't be long!! The french beans are poking their heads up, but they grow much more slowly than peas so will be resident in the greenhouse for a few weeks yet. 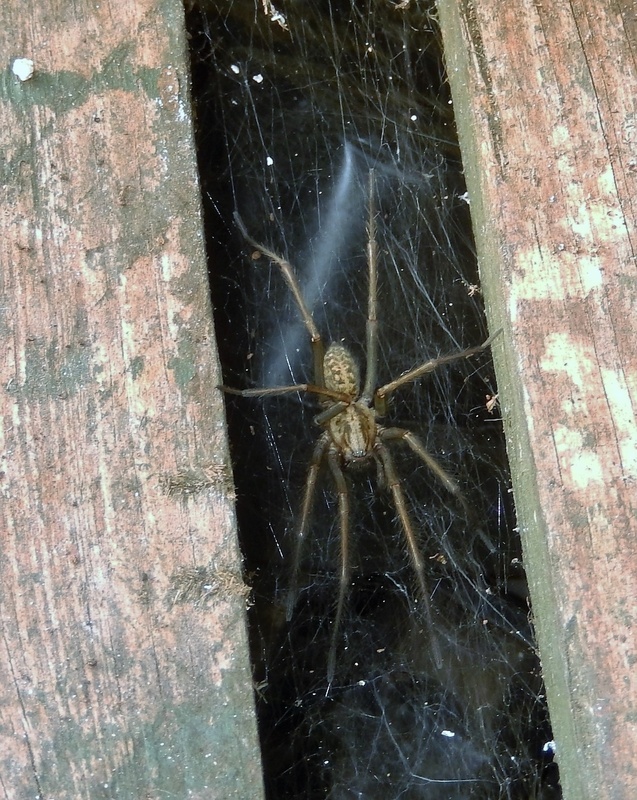 There is another resident here too, lurking in between the slats of the bench, enjoying the sunshine... here she is! Now I know who has been making those fine webs under the staging! 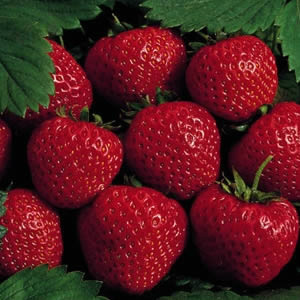 Honeoye strawberries --something to look forward to! I sifted through the packets of tomato seeds today, to try to work out how many of each I can fit into the greenhouse and baskets at home, the mintunnel, giant cloche and under cover pots at the plot, and then the bed which will be free once the Autumn onions have been harvested. 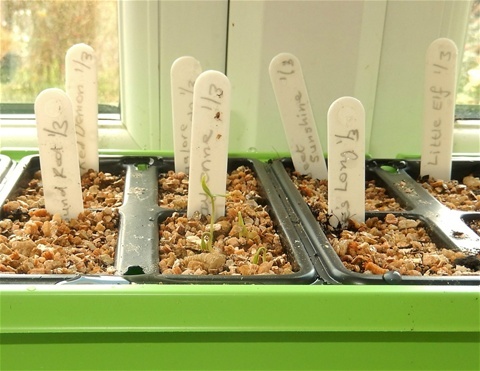 It is far too early to sow seeds for this last lot, but all the other ones will be grown indoors and are now sown in the propagator on the kitchen windowsill, together with the sweet peppers. 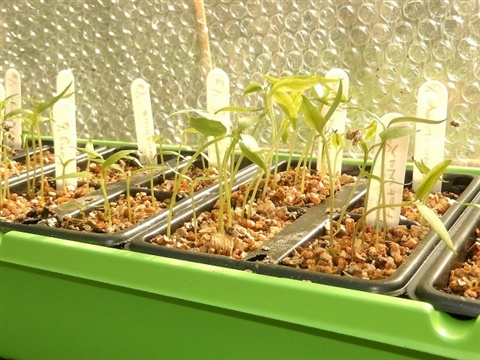 The chilli seedlings have had to move to the greenhouse, where they will get more light anyway, so that is no bad thing. Every year I end up with far too many tomato plants, and although I can usually find homes for them quite readily, the problem in cramming so many into the greenhouse is that they end up leggy. Not only that, but in taking them in and out of the greenhouse to harden them off --plus by then squashes, beans, courgettes, sweetcorn etc as well, something is inevitably damaged so.... this year I am being careful not to grow what I don't have space for and have some faith that what I sow will germinate, not sow double the amount "just in case"! With this resolve in mind, this is all I sowed. I do love a good mix of tomato colours! They were joined by the Peppers: Sweet Purple, Spanish Sweet Red Giant, Bullshorn, Milo's Bulgarian Sweet Red and Topelino, to give me around 25 -30 plants eventually altogether. Most will be planted out on #146, covered by a tall cloche that has seen better days to give them a modicum of protection from cold winds and I shall also plant a few in a very sheltered spot against the south facing side of the metal shed on #145. If we have a chilly summer I'll rig up some sort of plastic tent for them, but at least there is plenty of blue water pipe etc to use for supports! And lastly, my new strawberry plants arrived this morning. Honeoye and Florence, which might give us enough for a little taste this year. The main strawberry bed is now on its second year though, so will hopefully crop well, and there are more plants on the two tiered strawberry table too. Could have enough for a real feast this summer!! 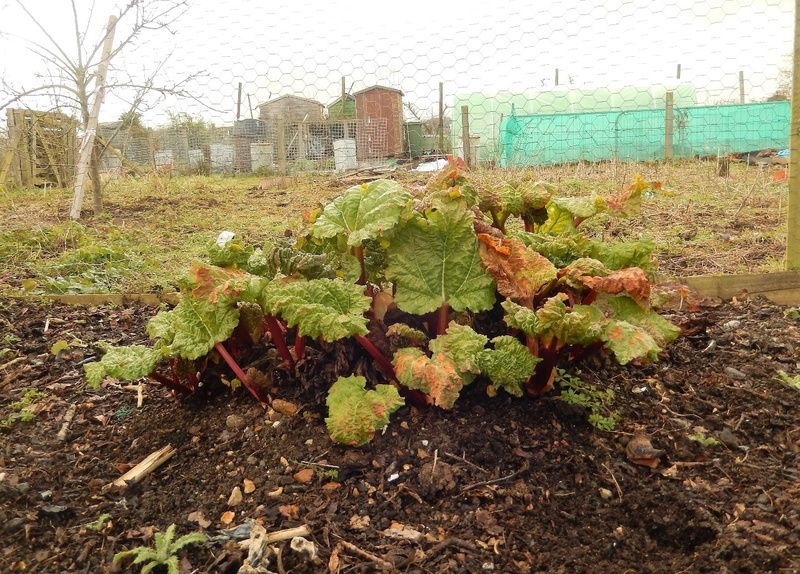 Rhubarb will soon be tall enough to start picking...mmmmmm! Muscles we had forgotten we had, and a brand new bed! The huge old chestnut trees in our local park have been deemed unsafe and so are being removed before they fall on someone. The chippings have to go somewhere, so why not to our site? 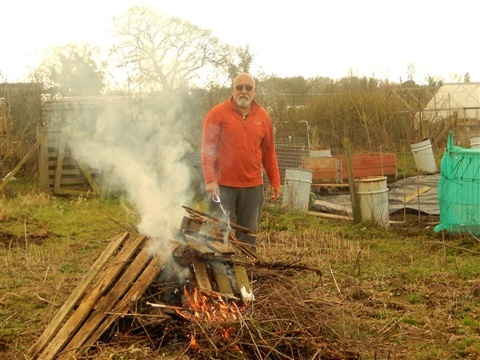 Many thanks to Joe, our plot neighbour, who suggested this to the workers ... an excellent idea! As a result, Plot 146 is sporting smart new paths after I transported ninety six builders' trugs of woodchip from the dunes of it by the main gate round to its new home. It took me two days of concentrated effort to move what was needed and spread it evenly on the paths. I must admit as I got colder and colder in the driving sleet on Saturday morning, I had to convince myself it would be worth it in the end. In the meanwhile, my OH was hard at work on P145, clearing away the rest of the rubbish, moving things from our slightly overstuffed shed on P146 to the two new ones, and best of all, digging out the first bed.To be honest, he has started with the toughest bit, as the ground is full of raspberry roots, which hang on for grim death when you try to dig them up, as well as nettles and couch grass. A bed 5m by 1.5m is no mean feat, especially when you think of all the huge stones he took out at the same time. It is sooo good to see inviting brown earth though. Is it any surprise that after a winter of relative inactivity we are both having those "my aches and pains are worse than yours" conversations? In an effort to be uber-organised, we have a plan for what is going to be planted where. This first bed will house our second early potatoes, and the next one (part of the second group of four) will be for maincrop potatoes. 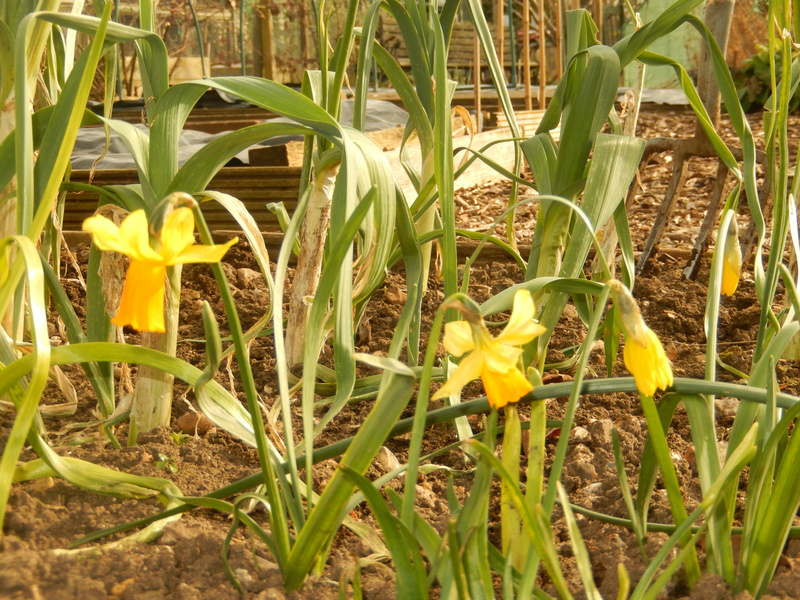 The first earlies will be planted on P146, where their cosy bed is ready and waiting. Another couple of weeks before they can go in the ground yet though.... all the seed potatoes are in the greenhouse at home quietly chitting away, full of promise. As a bit of a rest from carting woodchip, I counted our seed potatoes to work out how many of each would fit in the new beds, which are slightly larger than those of P146. I even remembered to write it down so when planting time arrived we shan't be there scratching our heads trying to remember what that really good "Grand Plan" had been! 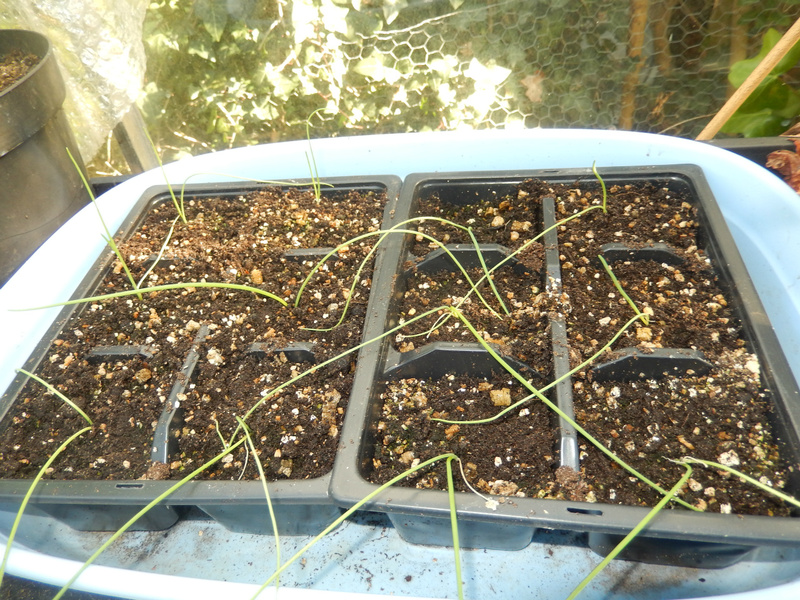 Some of the Spring Onions are in the mini-tunnel, and the rest are planted outside... OK, so my daughter thought they were chives at first glance, they are so small, but they will grow! I was worried last year when the clumps were a bit floppy to begin with, but the new leaves were good and strong, so I have faith that these will be just fine too. The idea is that the ones that have some protection from the worst of the weather will be ready to harvest before those planted outside. There are non-bulbing ones (Ishikusu) and bulbing ones (Purplette) to give us a bit of variety. Last year I rather overdid things, and ended up pickling some of the ones at the end of the season. Waste not, and all that! The mustard plants in the left hand bed have been really worthwhile. i put them in as plug plants last September, and they have given us a lot of small leaves for salad as well as some big handsful to use as a spicy spinach -ilike vegetable... excellent in kofta curry! Most of the Mizuna has been eatne now but there are still a few small Winter Gem lettuce that should fill out a bit yet. The Wizard beans are planted out as well. They look a bit straggly but now that they are outside, they should be fine. The string will hold them up off the ground. When they grow a bit, taller sticks and more string will keep them up alright. They are quite forgiving on the whole. 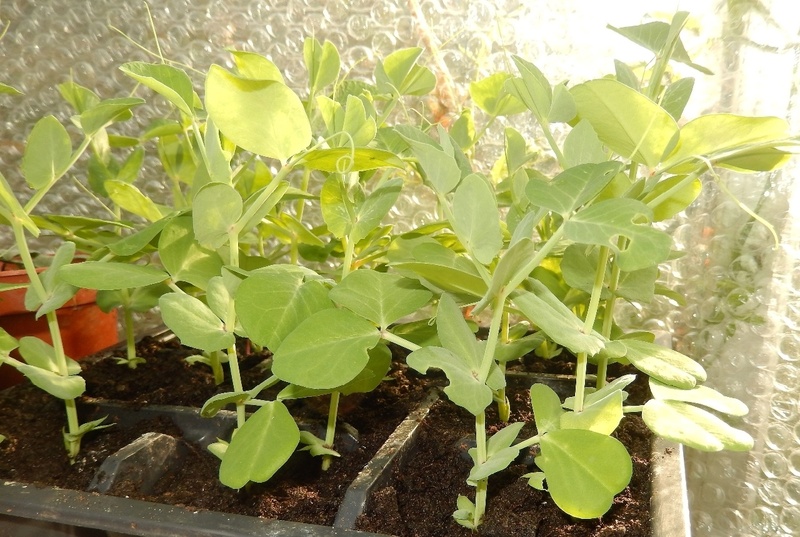 In the greenhouse at home the Kent Blue peas had 100% germination, much to my granddaughter's delight. She sowed these when she was staying with us recently. The plants will be hardened off next week and then transplanted into the mini-tunnel with some netting to support them. Last year's reached the roof! There are stirrings in the tray of Indian Golden Podded mangetout now. There is one little pepper (or chilli?) seedling there too. It came up in a pot that was left in the greenhouse over winter...anything that determined to grow deserves a chance I reckon. It can have its own pot when the peas get moved outside, and see what we get. And the winner this year is ... Cayenne!! The Cayenne chillies have won the germination race!!!! Of all those sown in the propagator six days ago, these are standing up straight and tall. I have made them a tinfoil reflector, to try avoid them growing towards the light of the window. We are away for a few days from tomorrow, so I hope it is effective, and there is a little forest of other chilli seedlings on my return, basking in their extra light. After this excitement, I went off for my morning round of the greenhouse, and surprise, surprise, I was greeted by Greyhound Cabbage seedlings ... it is wonderful when everything starts to grow, isn't it? 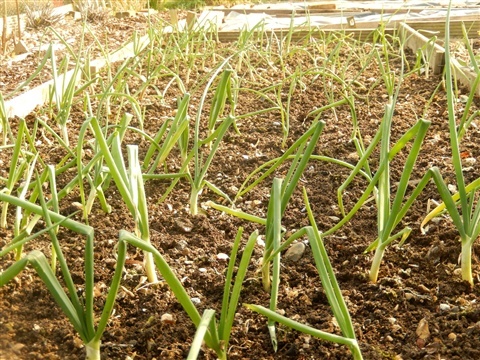 Bedfordshire Champion Onions sown late December -- hopefully the new leaves will be more upright! ...in the greenhouse. After a shuffle around to make some shelf space, I set to potting on the Bedfordshire Champion onions and those dozen sets I had put in modules a couple of weeks ago, plus the tomato plants I had for my birthday. When we had been clearing out the sheds on our new plot, we found dozens of six-space modular trays, which take up less space than a similar number of three inch pots -- result!! 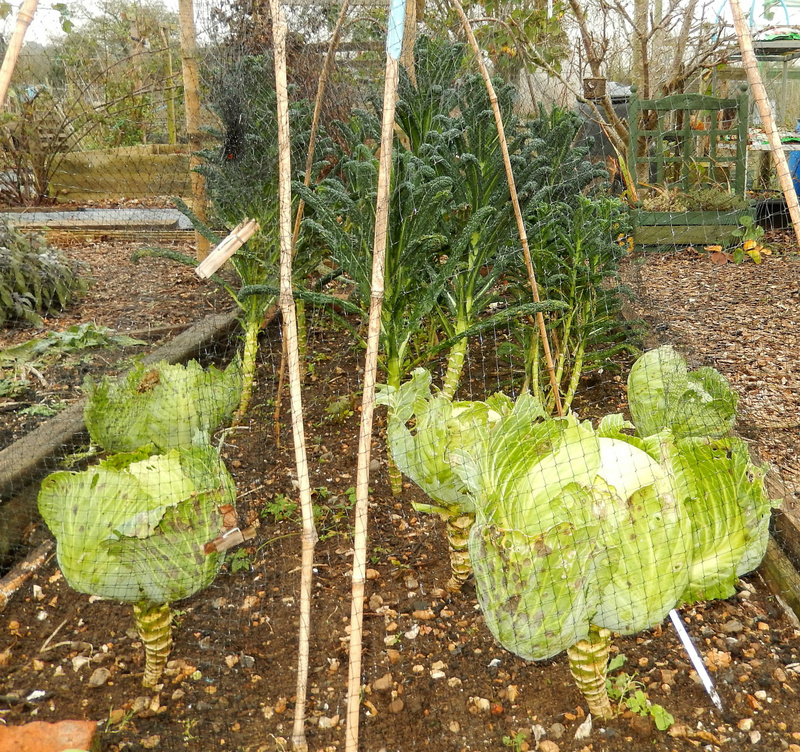 Greyhound Cabbage, Tan Tan Lettuce,Trafalgar Brussels Sprouts are now sown. Given the micro-sprouts we have this year, I thought I'd better get ahead with this season's plants! Purple Teepee & Aquilon French Beans and Golden Podded Indian Mangetout were both really successful last Spring so we are ooking forward to early crops in the mini-tunnel from these again this year. Having got into the sowing swing, I managed to clear enough space on the kitchen windowsill for the propagator, which quickly filled up with a whole range of Chilli and Aubergine seeds. I can't wait to see what Turkish Orange Aubergines are like! These seeds came with the Pass the Parcel and were undated, so fingers crossed they germinate. Sadly, the Lemon Drop chilli plant I attempted to overwinter has shown no sign of growth, so out it went. The Alberto's Locato Rococo however, is growing away quite quickly now. I sowed seeds of both of these, saved from last year, as both are delicious chillies and if I end up with more plants than have space for then I can certainly find them new homes. The Gardeners' Association we belong to hold a plant swap evening in May, and it will be good to have something interesting to offer. All in all a very satisfying morning. These look quite good, don't they? Until you realise the whole plant is only about 40cm tall!! I know some people call sprouts Fairy Cabbages, but these are tiny enough to fit on a fairy's plate. 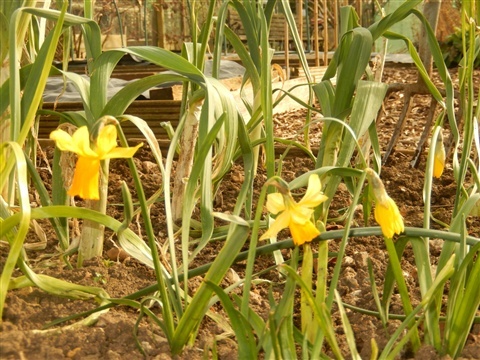 With daffodils and leeks growing together, we have nicknamed this our St David's bed... Happy St David's Day!! Once the rubbish was cleared, the ground was pegged out to show where the growing beds would be. The original plan was changed, but still kept the principle of two sets of four beds, although the beds themselves will be longer. Plenty of space left for flowers too! The area for the polytunnel is covered now .. it looks huge! With all the rubbish out of the way and the beds pegged out, digging can begin. Give it a few years and Plot 145 may look like this -- if we have done it once we can do it again! February "roast dinner" harvest!! The potatoes are from our cold store. 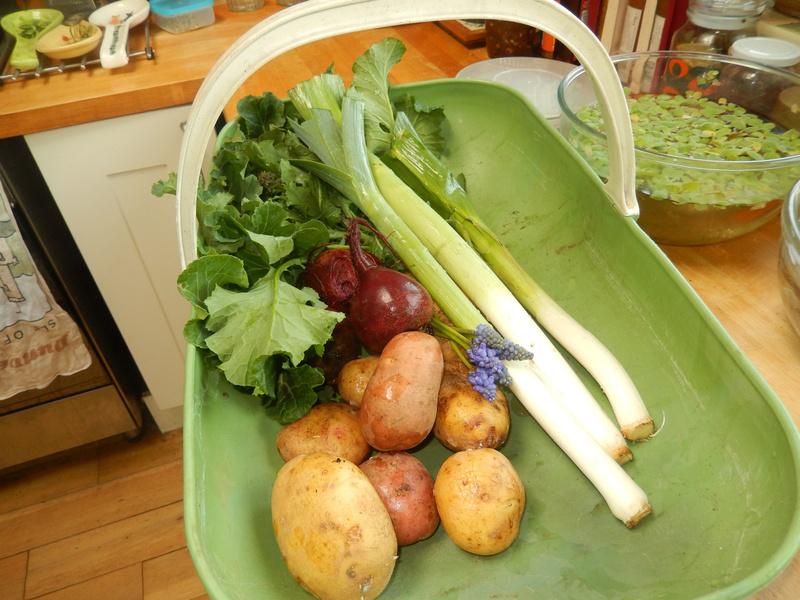 I forgot to put the parsnips in the trug after I had washed them... they were the last ones for this Spring too. We shall have to sow an extra row this year. Autumn Onions are looking healthy, despite the rain. They do look better now that the moss on the soil surface has been removed though. The white stemmed chard has survived but the red one melted away. Pigeons seem to have taken a liking to the green leaves, which has never happened before. There is an extra day this year as it is a Leap Year .. one extra day of Winter! Looking at the long range weather forecast, it seems that March is predicted to be very cold indeed, with a real freeze across the country at the end of the month. Oh, deep joy! So much for me being able to move some plants out to the plot before then. The "real" first day of Spring I think of as being the Spring Equinox though, so another three weeks of Winter still in front of us regardless. Apparently all the signs are that there will be a mass of warm air developing over the Arctic, forcing cold air southwards to us, leading freezing conditions across the UK for about a fortnight, just like we had in November 2010 and January 2013. I remember the chaos of those times, with people panic buying, no deliveries to shops for a few days and us being virtually housebound due to the deep snow. Our stored harvest saw us through with plenty to eat, although we did have to bring the sacks of potatoes and onions indoors for a while as they would have frozen out in the garage. In my attempt to walk to work one day, I got trapped in a blizzard. Foolhardy to even have gone out. It was awful. Older and wiser I would stay put now! I have held off sowing chillis and aubergines for a month later than last year, so that when we are away at Easter there will not be large plants needing lots of watering etc in the greenhouse, or even in the propagator indoors, because they would get lop-sided without daily attention. We try to plan our growing and holidays together to make it all fit.... and then there is the weather. I shall certainly be keeping the insulation up in the greenhouse through into April!! We did get masses done on the plots today: Plot 146 is good to go, with the front flower beds weeded too, and Plot 145 has the polytunnel area now covered and ground breaking has begun! Five hours of hard work but well worth it! 28th February -- What do you make your paths out of? We have been much busier outside this week, as it actually hasn't rained, and on a couple of days has even been quite mild. Plot 146 is clean and tidy, with no areas left to weed except the giant cloche-thingy now, and the Autumn planted onion sets have decent dark green leaves all standing up and growing away well. It shows how wet it has been that moss was growing on the soil of the bed, and although I removed as much as I could no doubt any tiny piece will regenerate, so I shall have to keep an eye on things and act quickly if it starts to look like it is coming back. It may have arrived along with grass cuttings from our lawn at home that went into the compost I suppose. 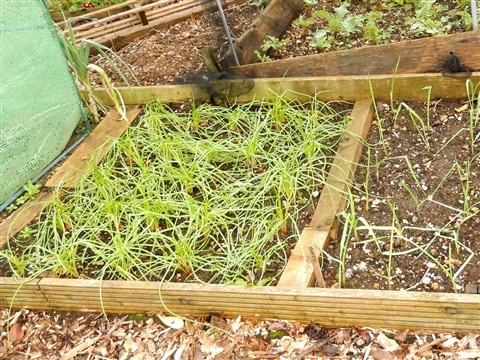 The shallots and garlic are thriving, although their leaves are looking a bit pale... time for a feed? Talking of feed, the onion seedlings at home had a dose of seaweed juice last weekend, and already they are looking perkier. Roots are beginning to grow out of the bottom of the modules and so the Bedfordshire Champions need potting on. I am a little worried that the 16 pots that this will lead to might make the staging a bit overcrowded. I am doing my best to get the Wizard beans, Spring Onions and Sweetpeas hardened off but we have had some heavy frosts at night this week and so they have only been out during the day. It has meant that they have enough light though and are not too leggy. The newer leaves on the Wizard beans are not crumpled from aphid attack, after the epidemic following our holiday, but I do still spot the occasional hopeful blighter to promptly squish. And of course there are all those egg boxes full of seed potatoes quietly chitting away in there. Maybe they can go in the ground by the end of March? I always think that St Patrick's Day on 17th March sounds a good day to start with this, but on the other hand I don't want to have to worry the potato tops will get frosted. It is a balancing act all round! Oh, I nearly forgot the Kent Blue peas that are starting to germinate: another modular tray to find a space for in the light. 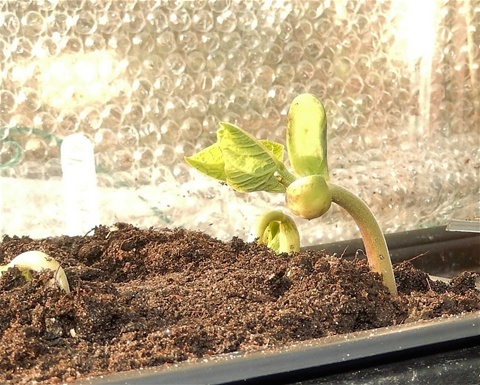 It'll soon be time to put up the little plastic tomato blow-away at the end of the garden as their "half way house" between the night time protection of the greenhouse and the total exposure of the plot. Fortunately the end of our garden is very sheltered and so the plastic construction has so far managed to stay on the ground during the last couple of Springtimes. It is very useful indeed and well worth the few pounds it cost. Some plot holders at our site still insist on trying to utilise these unsecured outside ... and yes, they do indeed blow away, often quite some way away, too! I feel a bit sorry for them really. Our new plot is slowly taking shape. 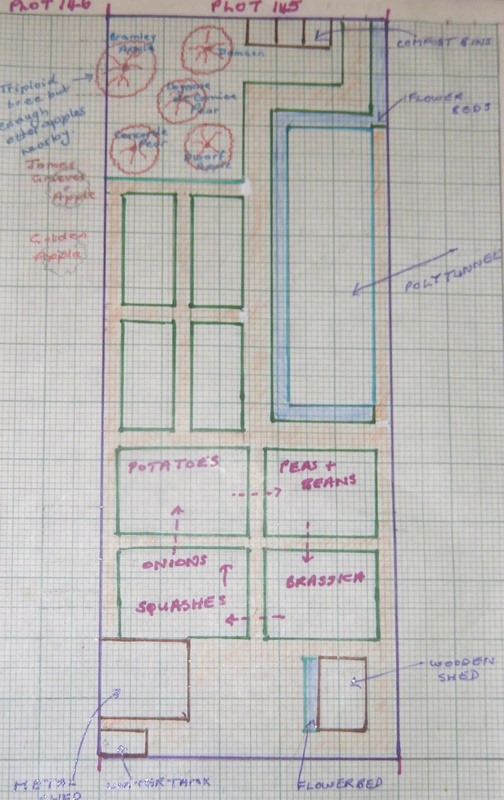 Marking out the beds and paths, plus the space for the polytunnel and compost bins has been very useful, and has led to a few changes to the original plan. Moving a couple of ground pegs over by a metre or so is much easier than trying to move a bed that is already part dug, for sure. It has also enabled us to keep the areas which will be covered for now all together, which will be much more straightforward to work with. All good. Of course the thorny question of what to make the paths out of came up. Grass paths would be lovely, wouldn't they? Or would they? All that cuttung and edging, the muddy trampling in wet weather...maybe not. How about trodden earth? 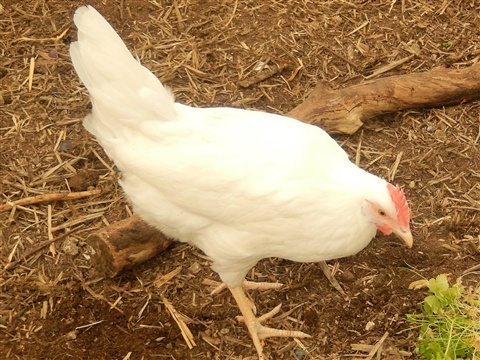 Not on our clay soil, a recipe for a slippery disaster. 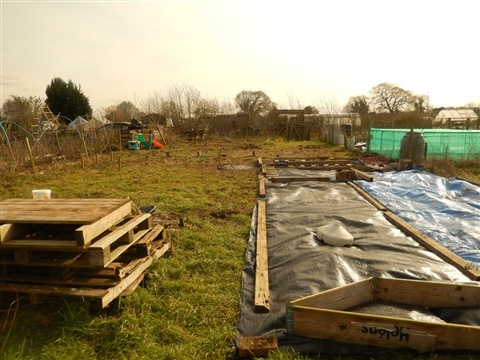 On Plot 146 the paths are landscape membrane overlaid with woodchip, which is topped up at least annually as it rots down to compost. Keeping on top of the weeds that grow in the paths is a long job and one which we are not keen to replicate. Cover the paths in membrane but remove the part rotted woodchip every time before adding new chippings, and add this material to the compost heap or else dig it in to the adjoining bed if suitable. Now why didn't we think of that????? A no brainer that will also get over the issue of the depth of the path building up and fallng onto the beds too. As we did not want to edge the beds with anything it had seemed a further problem, but no longer. Thank you, thank you, thank you. Lots of information out there, just have to find it! On the same day, the Allotment-chat Pass the Parcel arrived, packed tightly with all sorts of goodies I had never heard of. I took out quite a few packets, and put in lots in. Luckily I managed to get the box closed again. This is such a great way of sharing self saved seeds, as well as those we shall never use but are still in date. I had vowed never to grow achocha again, but the Giant Bolivian version has swayed me into giving them a go, Turkish Orange Aubergines sound irresistable and some squashes with "naked" seeds ie without a hull so easier to eat, were added to my stash: Lady Godiva and Kakai, plus a tiny one called Munchkin with bright pink seeds. These sound ideal for growing up arches with that achocha. Tall purple podded peas also somehow found ther way in... such a sucker for peas, me! I already have those Parsley Peas to try, which are described as virtually self supporting. I must make sure the pigeons cannot get to them this year: last year the early peas never gave us much because the pigeons decimated the shoots as they grew above their little framework of twiggy sicks. Nets it'll be for sure this time!! The Parcel's next stop is Glasgow. It will travel hundreds of miles before resting for the Summer with the Keeper of the Parcel. 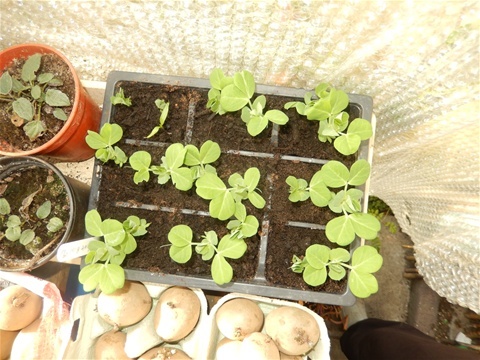 With help from my six year old granddaughter, 18 Kent Blue peas were carefully sown on Wednesday, two to a 9cm module,. 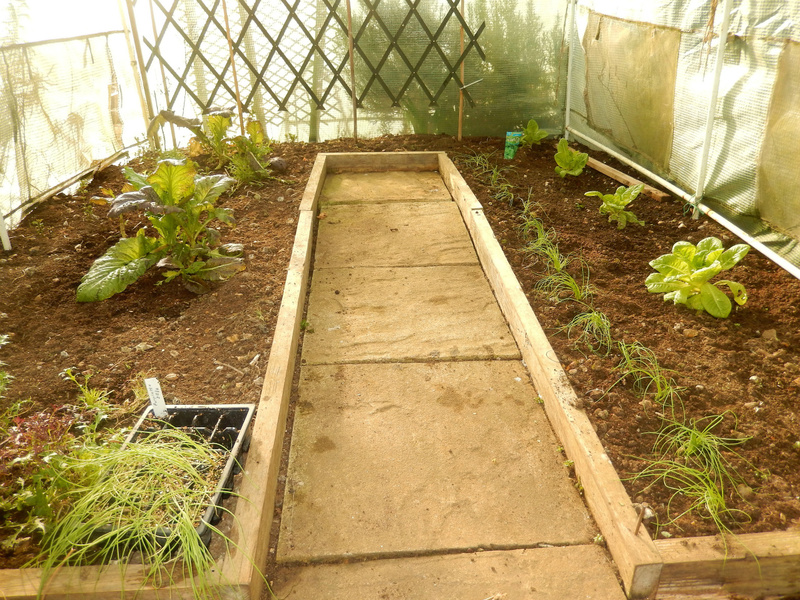 The plan is for the plants to grow in our mini-tunnel at the allotment and give us an early crop of mangetout. Some Golden Indian Mangetout seeds will be joining them - I shall sow these this afternoon. The Jolant leeks I sowed at the end of last month are straightening up now, but there is nothing from the Autumn Mammoths. Maybe the seed was too old. I reckon the one that did make an appearance is actually a Jolant that jumped into the other side of the tray! I shall get some fresh seed and resow. There is plenty of time. 16th February - Family tree planting!! Sooooo grateful for a few days without rain, even if the highest day-time temperature has been 5°C. The early crocuses in the lawn at home opened in the sun like golden jewels, and a Small Tortoiseshell butterfly sat soaking up the warmth outside the greenhouse door yesterday. At the plot however, the wind was arctic and the ice on the water in the bath was a reminder that it is still really Winter. We paced out where the two new pear trees could best go, and decided on the most suitable place to move the dwarf apple tree to. With help from our daughter-in-law we started to dig. Surprisingly the ground was not too hard or sticky and there is a good two feet of top soil before getting to the gravel pan, which is excellent. That dwarf apple tree fought back determinedly and it took three of us to get it out of the ground. Lots of the roots were damaged in the process so we had our fingers crossed when it was re-planted. Hopefully it will grow new feeder roots when the soil warms up. Upright, it is about 7 feet tall and a pretty good shape too. Let's hope it survives. Given how hard the roots on the new pear trees we bought had been pruned back, it may have a better chance than we first thought: time will tell. We cleared a large area around the trunk of each tree, taking out mats of nettle and couch grass roots. It is going to be hard going to clear the whole orchard area ... really glad that the other end of the plot seems less "nettley". 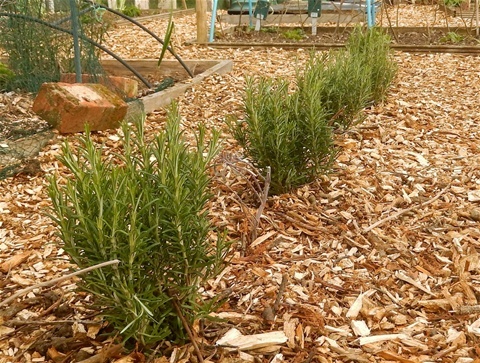 Recent advice on planting trees is to dig a larger hole that you think you need, and not add any manure or fertiliser to the soil as you back fill. This apparently encourages the tree to send out roots further afield in search of nutrients, rather than just rely on what is in the immediately surrounding soil. The trees were firmly staked against the prevailing wind, as previously planted trees had grown at a 60° angle and we would really like these to stay upright. The two pear trees look really tiny next to to the others, but they will grow. Our little orchard now has these two pears, a cooking apple, an eating apple and a damson on Plot 145, and two further eating apples next door right by the boundary. As the cooking apple may be a Bramley's Seedling, these other trees will help with pollination if needed. 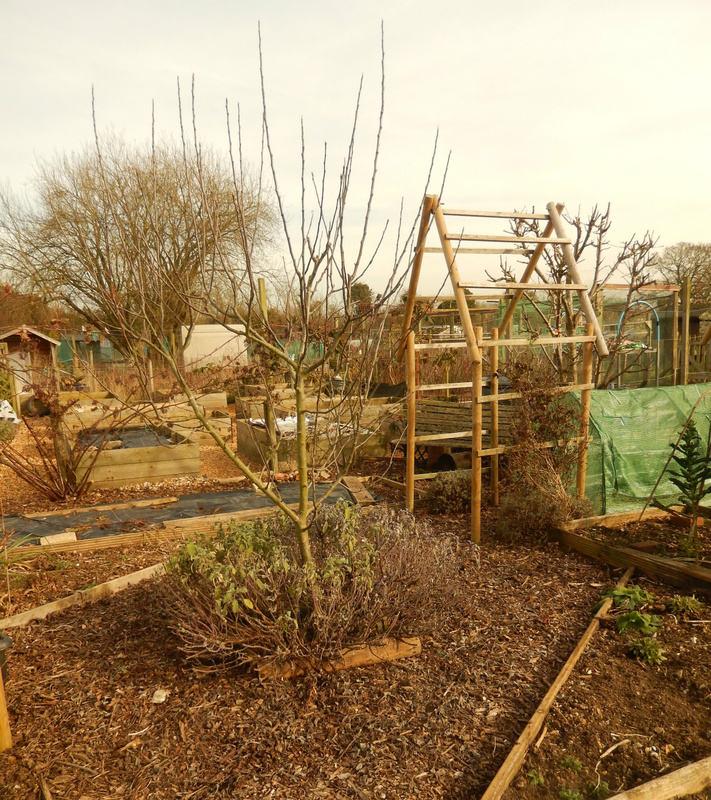 There are also three cherry trees, two in the fruit cage, a plum, a greengage and another dwarf apple next door on Plot 146. We have some small fruit trees at home too - two pears, three apples, a fig and a plum - let's hope they all flower and fruit well for us for many years. Here is the plan!! It might change as we go along of course but as I said before, it is good to have an outline at least. Hand drawing helps me embed the overall picture much more easily than CAD versions, so here it is, coloured pencil and all!! This does feel a bit like virtual gardening though ... I wish it would stop raining so we can actually go and do some real work. At least we are organised I suppose. Along the boundary with our other plot - to the left - are the compost bins, a long, narrow fruit bed, a space through which we shall make a gateway between the two plots, and a mini tunnel. Access to this fruit bed from the other side will be much easier now! Crop rotation is sorted too. 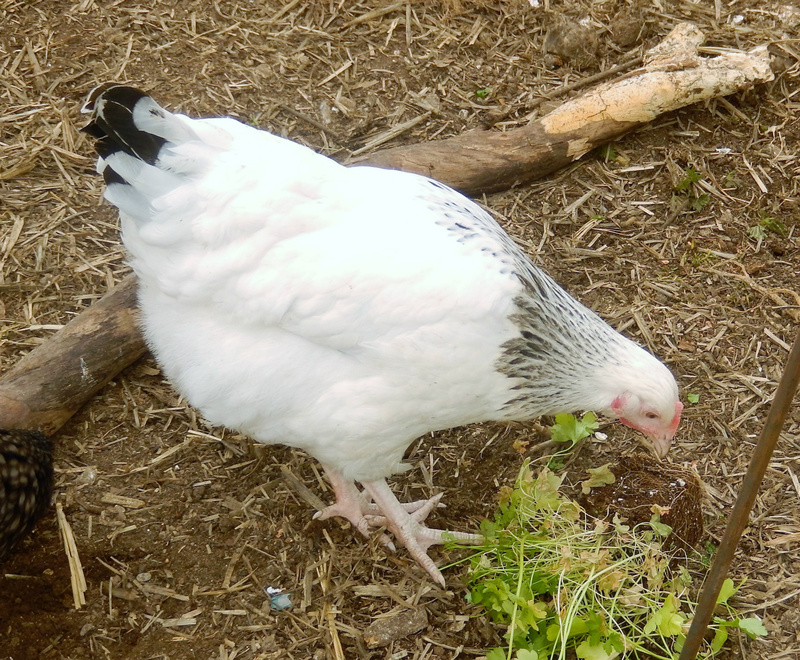 I try to keep Brassicas away from the potatoes where possible. Brassicas like lime, whereas limy soil seems to encourage scabby potatoes.There is a school of thought that lime is more effective the year after it is added to the soil, so we add lime after the potatoes are lifted in the Autumn, and Brassicas are planted in it two years later.This year, Plot 146 will have anything that needs to be sown or planted early as the new plot will take a few weeks to have any ground ready for use at all. While we were away last week, things grew apace in the greenhouse, including the greenfly!! Some of the leaves of the Wizard beans are distorted and there are insects visible on the stems too. What a nuisance! I have made a start on squashing them, but there are always some that get away so I shall have to be vigilant from now on. 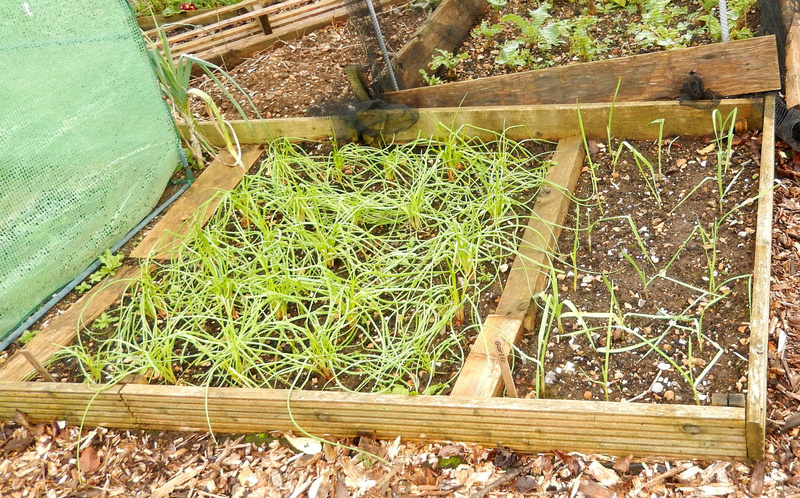 The Jolant and Pot leeks sown on 30th Janaury are showing their little green elbows above the compost, and the onion sets planted in modules have shoots over 10cm long already. I think it might be too warm for them in the greenhouse so they will be going out now so their growth hardens up a bit. No sign of the Autumn Mammoths yet, but I am resisting furtling as they must surely be alright down there! There is a forest of sweet pea seedlings too. Once they have a couple of sets of proper leaves grown I can pinch them back, but they don't need to be inside now they have germinated.. far too warm for them. - The area around the sheds themselves will be membrane with woodchip, for easy access to the water tank behind the metal one. 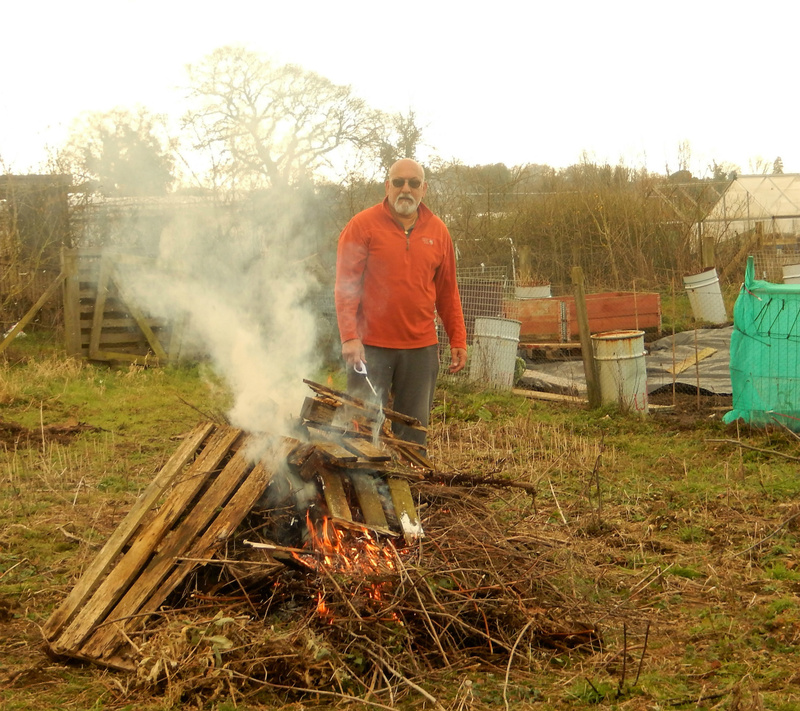 - Compost bins will be sited at the top end: there is capacity on our current plot to begin with, so no rush there. The pallets from the middle of the plot can be used to make new ones when we need a break from digging. - Polytunnel to run along the boundary of the neighbouring plot, but not this Spring. Its space will be covered for now. 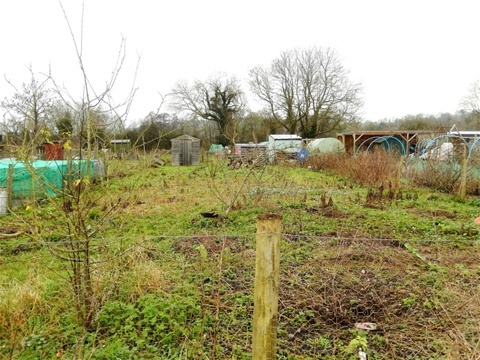 This has been a BIG decision, not just because of the costs involved but also the siting of it to avoid casting a huge shadow over either of our plots or our neighbour's plot: it will run roughly North- South. The position really needed to be agreed first, and other growing areas planned around it. Let's hope we have this right! If we can get it in place this Autumn that will be amazing. 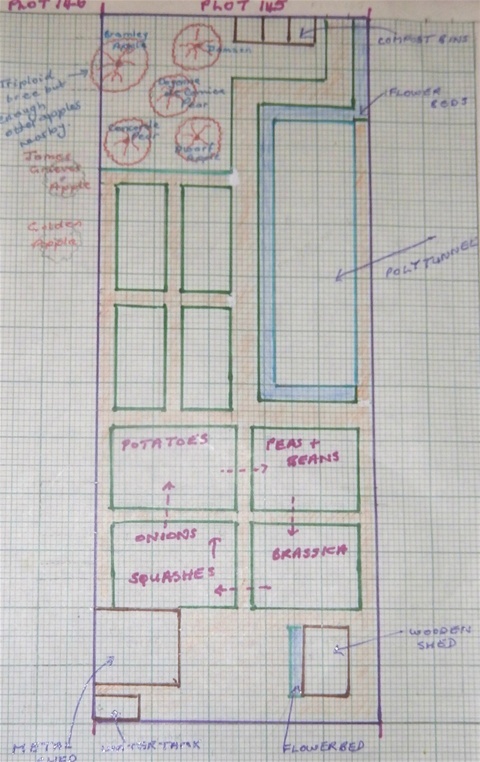 There will be a 50 cm flower bed adjoining the doors at each end and the long side facing into the plot. Hopefully that will protect the edges of the cover where they meet the ground so they don't accidentally get strimmed!! - The areas to the side and the front of the tunnel will each be divided into four equal sized growing beds, giving us eight in total. 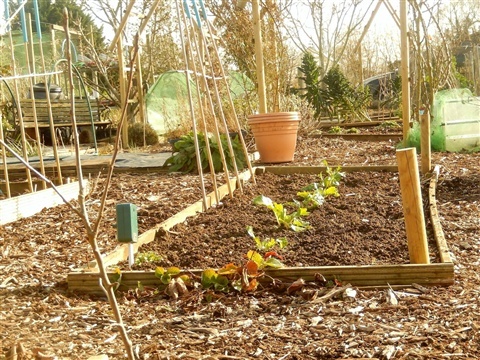 On Plot 146 the beds are edged with wood, which is now starting to rot, so these ones will be "lazy beds" instead. 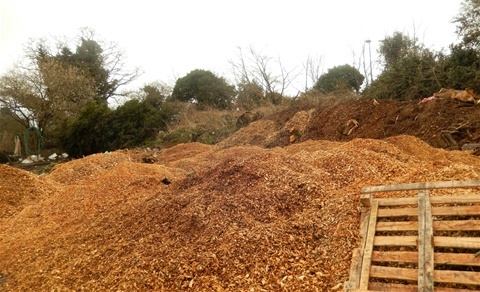 Not sure how we can avoid woodchip from the main paths from falling into them and hope this becomes clearer when we are actually digging the sides, or someone suggests a workable idea. We currently have beds in sets of four and this has really helped with planning crop rotation, so we are using the same principle again here with two sets of four larger beds, which can have temporary membrane paths added where needed to save walking on the soil itself and getting muddy. Have to see how that works. We shall start digging where the lower set of beds will be, and cover the top area. 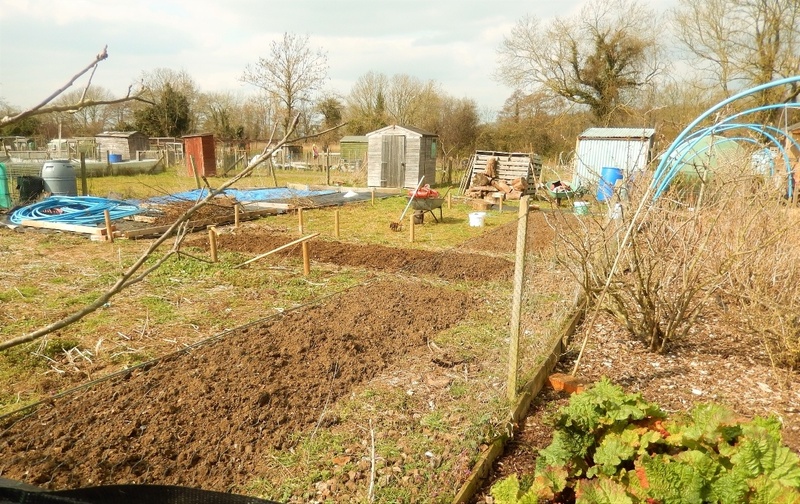 (We usually use black plastic well weighted down, but green manure s another option to consider) That will give us four beds to work with this Spring, weather permitting. - The fruit trees already there are at the top end of the plot so our two new pear trees (Doyenne du Comice & Concorde) will join them next week. 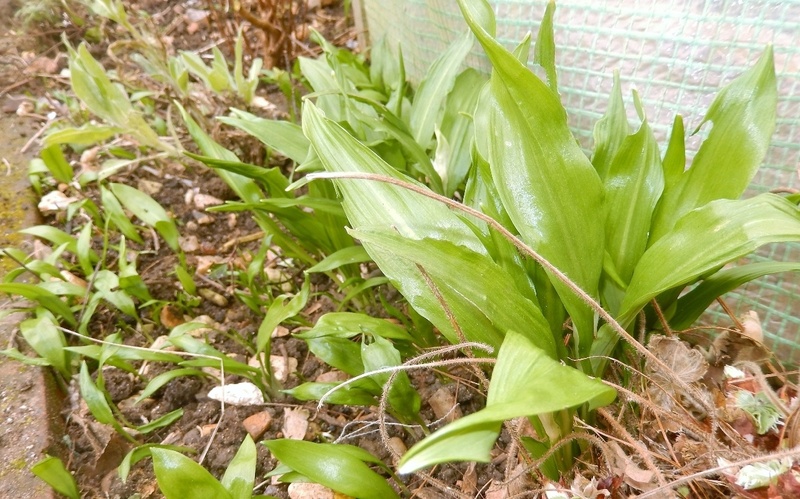 They have put on a lot of soft green growth during this mild weather, but you can see they have already each split into several bulbs. I have never grown a long variety before so I am hoping they flourish. The Garlic has plenty of space after last year's rather cramped effort. Elephant Garlic (not in the picture) is in the bed nextdoor. The Cavalo Nero Kale is a staple - reliable and with an incredibly long season. We have been picking it since last September, and it looks good for a few weeks yet. It will throw up flowering stems soon, and these are delicious cut before the buds open and cooked gently. 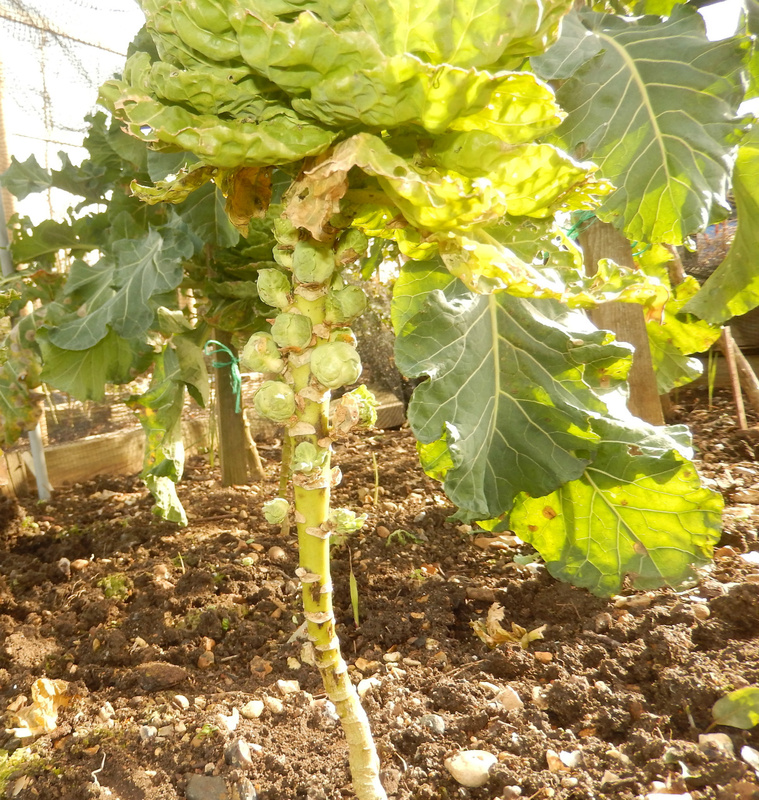 I must have sown a late-maturing variety as we are still waiting for the sprouts to grow! It will be worth the wait though.. at least I hope so!! Busy morning down in the greenhouse. I was getting concerned that the BC onion seedlings, which now all have their second leaf, were virtually horizontal. I know I was told they will straighten up eventually, but I had also read (Medwyn Williams) that the necks can grow bit crooked if the leaves are not held up straight. Decision, decisions. Then I remembered I had read on John Harrison's Forum, posted by Salmo, that he trims the first leaf to half its length once there is a second leaf... and so with bated breath I carefully trimmed one, and hey presto! The little plant sprang upright!! I have done them all now and they look good. Sowed the leek seeds in an 8cm deep catlitter tray (a tip from Digger Dave years ago), obviouslyy with holes in the bottom: Jolant for an early crop and Autumn Mammoth for the ones next Spring. I was given some Pot Leek seeds for Christmas so I sowed a few of these to see how they do. Not convinced, but I am prepared to be surprised. 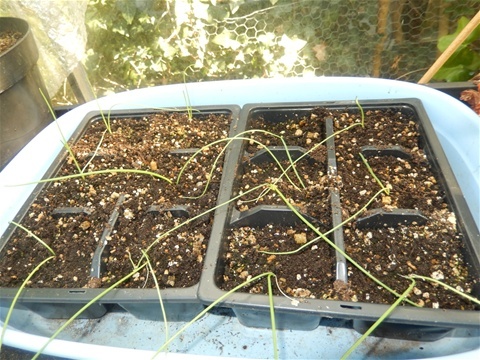 I also planted six of each variety of onion set in 3cm modules, to see whether these onions, which I shall plant out at the same time as the others go in, grow into larger onions or not. Some people plant all their sets in trays of compost, but as I have around 150 I am not doing that... not enough space in the greenhouse for a start! Worth a try with a few though. We shall see. I am attempting to overwinter two of last season's chilli plants, and I cut them back hard in December. Alberto's Lococo Rococo has a lot of fresh green growth already, whilst Lemon Drop so far shows nothing. I can always sow more seeds of this one, but I only have one left for ARC, and they seem to be tricky to germinate. The large plum shaped fruits were delicious though, so I am hoping the saved plant comes good, and of course should start to flower much earlier this year. Goodness -- January nearly over already. Soon to time to sow the chillies and aubergines. Seeds are sorted and ready!!! Hurray! A sunny day at last! Off to the plot as soon as the frost had thawed, to empty the compost bucket and, at last, prune the Autumn raspberries (Polka), the currants, jostaberry and the gooseberries. The HInnomaki Yellow bush is now beginning to look much more goblet shaped, and there are dozens of flower buds evident...maybe a decent harvest to come. This bush has been a poor cropper so far, so I do hope we get something good this season. Weeded the whole fruit bed, all 14 m of it. There were mats of grass, dandelions and what we so nicely call sticky willie, all grown from seeds that came from next door. It took me nearly two hours to deal with them all, and it served me right as I should have taken the time to do it weeks ago when they were tiny. 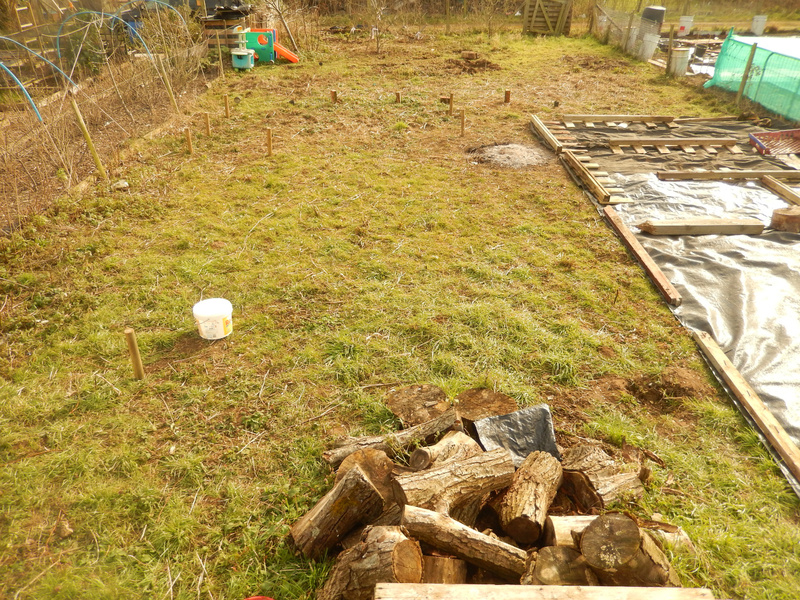 My husband walked about measuring his new plot, gauging where it might be best to site a polytunnel (!!!) 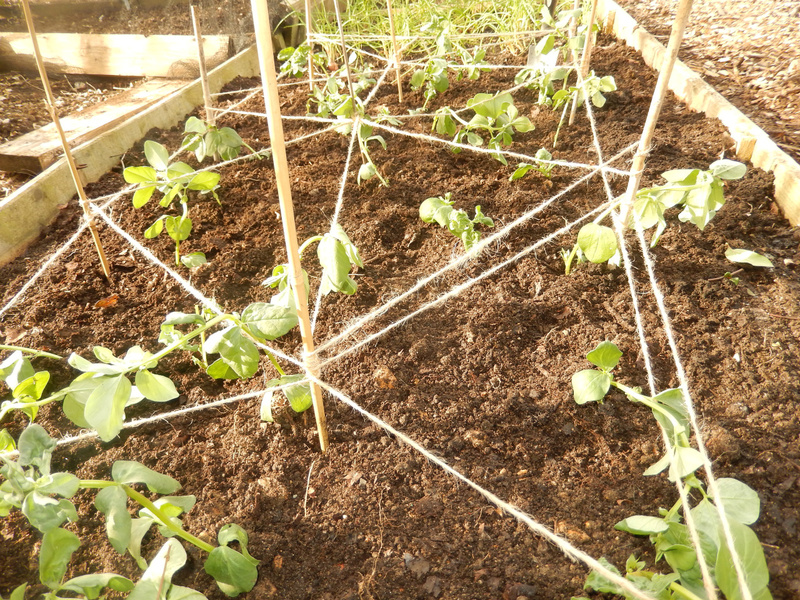 and how the growing beds could be organised to make crop rotation straightforward. No decisions yet, but some half formed ideas, including a swathe of flowers for cutting. Back to the seed box to think about that a bit more: lots of free seeds that came with magazines so might as well make use of some of them! The Seed Circle parcel had arrived while we were out, and it was torn open pretty quickly to see what goodies it held this year: lots of different tomatoes, some squashes, mustard greens and Chicago pickling cucumber, which i read somewhere originated in India. Last year our gherkins did well and we still have several jars of pickles left, so it'll be interesting to see how the two compare. The Wizard Beans are showing their heads, and all the onions sown at the end of last month are looking healthy. I never know whether to take the remains of the little black seed cases off or not, so I leave them alone for fear of damaging their one leaf. It is all too easy to pull one out by the root... mind you, that root is very long indeed I have discovered! Some of them are growing their second leaf now but they have plenty of space in their modules for a while yet. Sweet pea seeds are in soak, to be sown in pots tomorrow morning. Last year I sowed them at intervals which prolonged cutting so that we had flowers at home right up until October. I love the scent of sweetpeas! 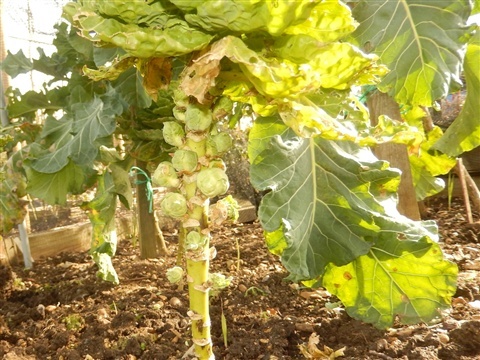 The earliest ones are already in the ground at the plot, and I hope they will be in flower by the end of April. Added more kitchen waste to the compost bin, mixed with shredded paper. I need to dig a trench to put this waste in where the Runner Beans will be planted, but eveywhere is so wet it will have to go in the compost bin for now. It has certainly been too wet to start on Plot 145. 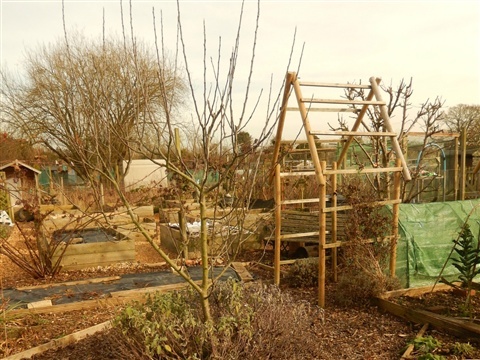 We have had a good look at the fruit trees: the smaller apple tree will be moved and staked securely upright, and we shall wait until the Summer to prune the shoots growing from the rootstock of the damson. The larger apple tree fruits well and will stay where it is. The onions sets arrived yesterday and are now sitting in the greenhouse in seed trays, to keep them in a good light and hopefully stop them shooting until the weather is suitable for planting out. This year we have Stuttgarter Giant and Hercules, both from DT Brown. There were a few soft bulbs amongst the Hercules, so I rang to query this and they sent me some more... a whole 250g more! Pleased about that as there will be enough to plant some on Plot 145 then. That's the kind of customer service we should always get. Thank you DT Brown! Sowed 36 Wizard Beans individually in two inch modules this morning. These were very successful last year and so I am hoping for a bumper crop again. 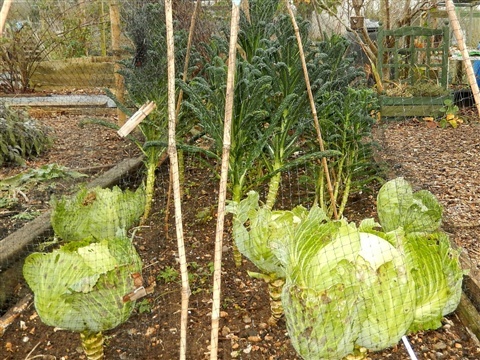 I forgot to sow them in the Autumn but they will soon catch up, and just crop slightly later. 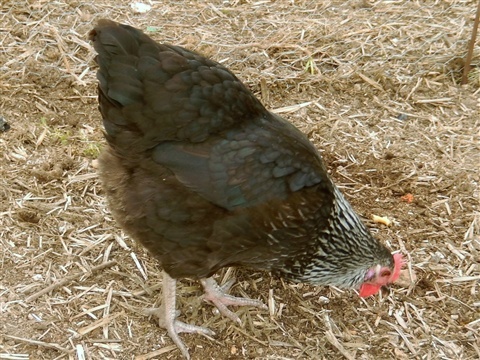 If I direct sowi peas or beans the seeds are eaten by rodents, so modules are essential. Took a while to learn this lesson, but the small amount of extra effort and compost is well worth it. I am aiming to grow more beans for drying this year. The stock of seeds from Cherokee Train of Tears has built up enough from the seeds I was given, and I bought some Gigantes from Real Seeds. Apparently germination is poor, so they kindly sent two packs. Can't be bad! It is just as well we have a second plot now, as these would never all fit on one in useable quantities. 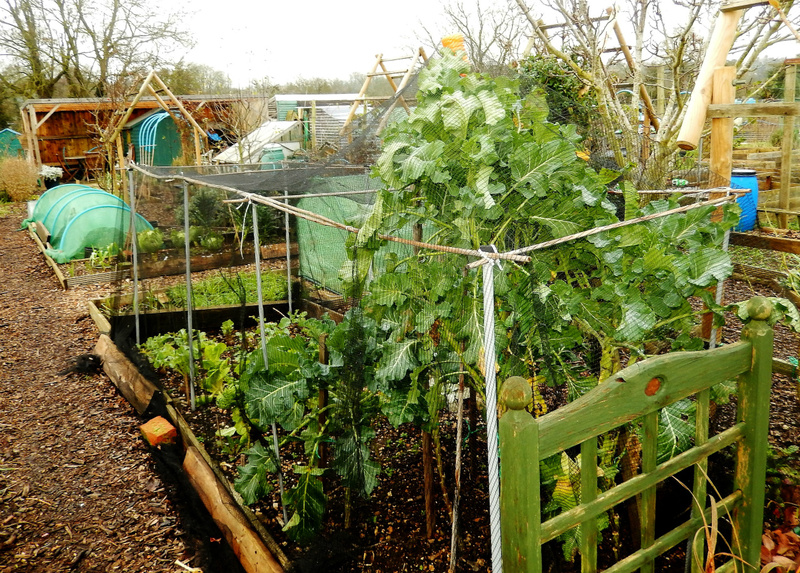 The mild wet weather so far this Winter means plants have put on much more growth than usual. The Autumn sown onion sets, the shallots and garlic all have lots of top growth and I hope this means they make larger bulbs later in the year too. We have had so few cold days. Have there been enough for our fruit plants all develop flower buds properly? Time will tell. On the plot we still have leeks, Cavalo Nero kale and cabbages, parsley, rosemary, sage, chives, thyme and oregano, with beetroot and carrots stored in compost in the garage. Trays of onions, garlic, shallots, one sack of potaoes are in there too. Cauliflower, calabrese, amange tout and runner beans in the freezer, dried beans in jars and lots of jars of jams, jellies,pickles and chutneys too. The potatoes are growing shoots now though, and I have to rub these off before peeling them, and the big onions are beginning to go soft, which is sad. This mild weather affects everything it seems, although with the larger onions this is partly due to them not being fully dried in the necks before bringing them home. And so now the new season begins! I sowed the onions seeds on 28th December in one inch modules in the greenhouse. 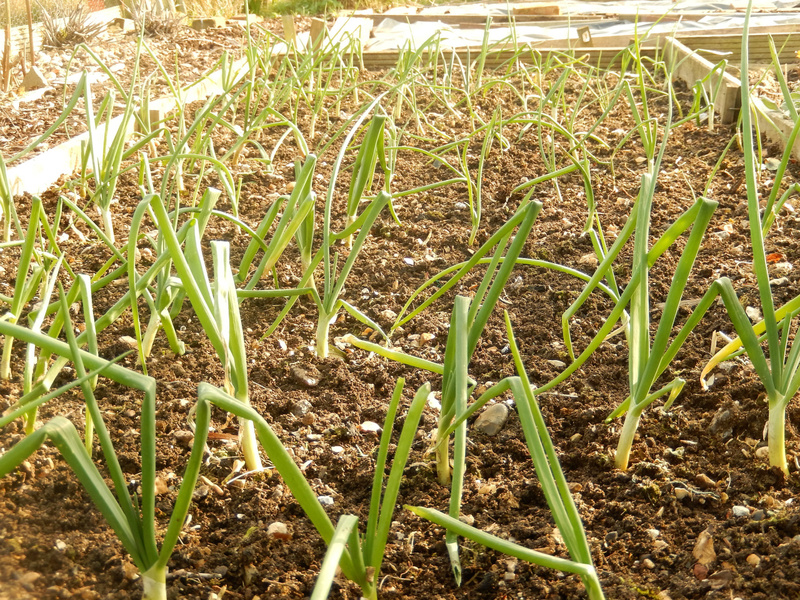 Bedfordshire Champion are single sown, and Spring Onions Purplette and Ishikuru sown in small clusters. These can be planted out directly into the ground in a few weeks. The larger onions will be potted on to keep them growing as steadily as possible.Itchy fingers have been satisfied for now!! 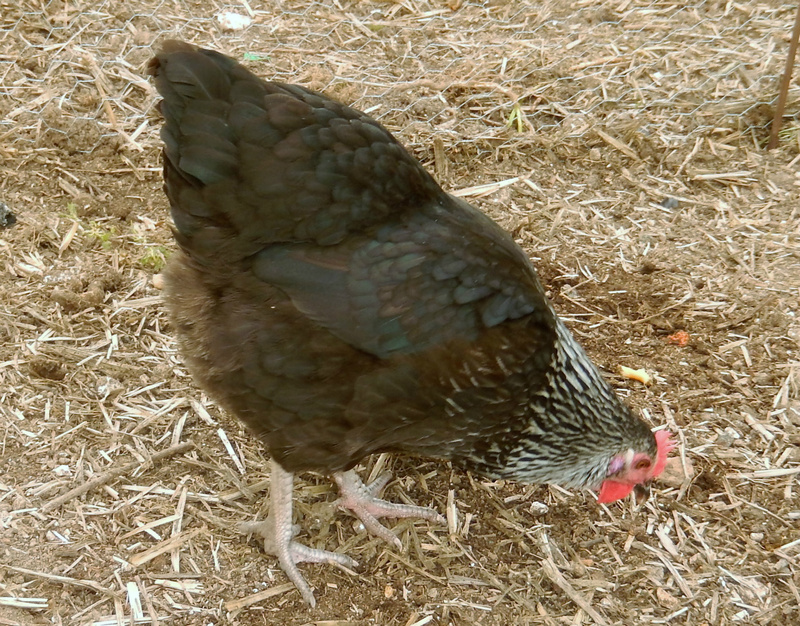 I mixed vermiculite with the compost (Jack's Magic) and lightly covered the seeds with some more. This helps keep the medium light and reduces the chance it will become compacted. We are taking over the plot next door, which has been a sea of weeds for years, with the occasional rotivation, so at least the ground is not packed down hard. Now that the tenancy agreement has arrived, we can plan for real, and have sorted through the seeds box to agree what will go in which plot. I have put this list on the Sowing Plan page. I daresay it will be added to or otherwise amended through the season but it is good to start with a list at least! I can then plan when to sow/plant them out, so hopefully avoid a massve log jam in the greenhouse before the weather is warm enough to plant out the more tender varieties, and ensure something is ready to follow on when harvests leave empty spaces. All sounds so good on paper doesn't it?? 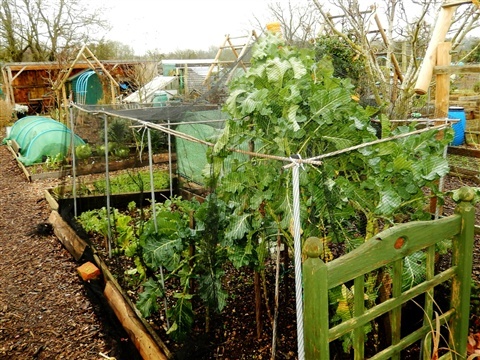 There is a big decision to make over a polytunnel, as this is a heavy financial investment. We are leaning towards more and more, as it would give us the chance to protect more crops and extend the growing season at each end too. 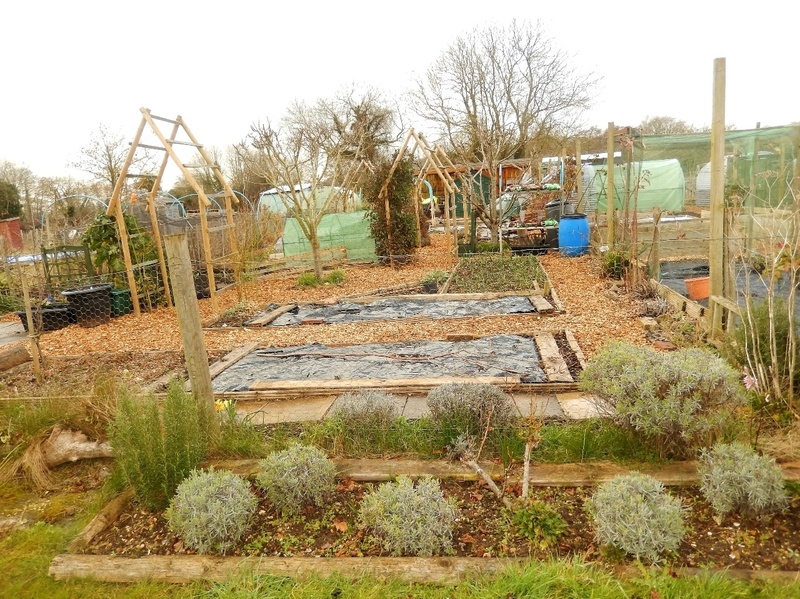 Not a day goes by right now when we don't start a sentence with "If we had a polytunnel, we could ...." so please let it stop raining long enough to measure up the space and see what size we could fit in and still do all the other things we'd like to!